The first of our community lightings was a good old giant Menorah in front of Temple Beth Israel of Highland Park and Eagle Rock. Here we are with Jerry and Gloria Schneider, who diligently came every night to light the lights! The second was a local library lighting and children’s’ event. It was at the Highland Park Public Library. Collaborating with the library, we offered a free lighting, story time, and craft. Thursday night was an entirely different vibe. Together with the Los Angeles Athletic Club, we offered (what we were told was) the first ever club Chanukah Lighting since its foundation in 1880. The event was held in the historic Blue Room, and once a speak easy that was the meeting place of local luminaries during prohibition (including many prominent Jewish members). 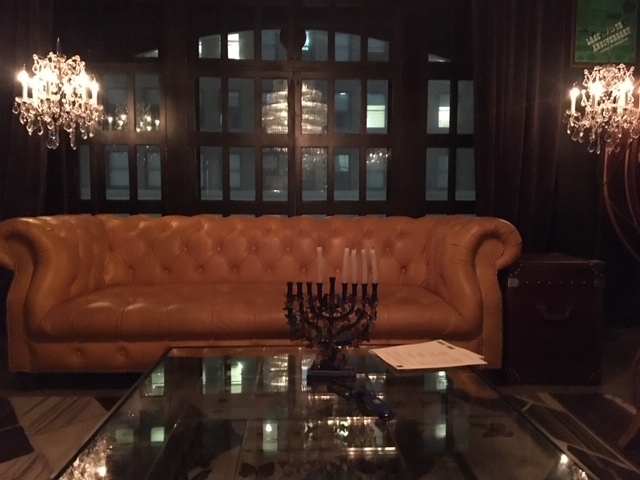 The event included not only a lighting and songs in English, Hebrew, Yiddish, and Ladino, but also tapas-style latkes courtesy of the Athletic Club and a special Chanukah cocktail devised by the Club’s expert bartenders. Friday night we held a Shabbat-Chanukah Dinner in conjunction with Temple Beth Israel of Highland Park and Eagle Rock. Thirty people or so came together for Latkes, quiches, salads cooked by the talented Judith Goldstein, and home made Moscow Mules from Greg Nelson. After a Kabbalat Shabbat featuring Chanukah melodies, the community adjourned to banquet tables in the softy lit social hall. The dinner was pleasantly interrupted many times by toasts, speeches, and raucous singing of Chanukah songs. Unfortunately there are no photos of this one. Happy Holidays and New Year! Looking forward to 2019. Previous Fun with primary sources.